There’s some hoopla today that the location-based social network Foursquare has found its business model (and as such, has beaten the more mature Twitter to one). But hold your horses. While Foursquare does have an idea for how to eventually make money (as we’ve discussed in the past), they aren’t actually focusing on making any just yet, co-founder Dennis Crowley confirmed to us today. While there is a Foursquare For Business section on the site now, there is no monetization plan for any of these deals yet. “[We’re] really just focusing on getting the product working properly (crashes / UX etc). [It’s] worth noting that we don’t want to shoehorn biz stuff in at the last min, which is why we’re trying to get local merchants involved now. Even if all the deals are freebees,” Crowley wrote to us in an email. 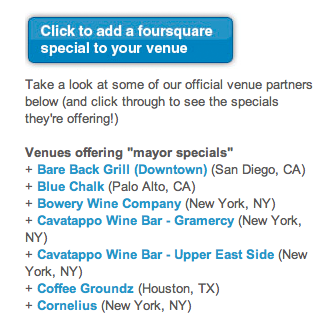 That being said, obviously, Foursquare eventually hopes these types of deals (dubbed “Mayor Deals”) become a business of some kind. But having just raised its first seed round of funding, and only having been in existence for a few months, Foursquare has some time. And it seems smart to do this type of stuff the right way, rather than just “shoehorning” it in, as Crowley put it. Crowley also says that they’ve been adding a good number of these specials recently. And they finally have a tool that makes it easy to do so. So we should be seeing more such deals in the future both on the mobile apps, and the website. You can see the current list of deals on the right hand column of this page. As you can see, most are in California or New York, which is where the service is most popular right now. When Foursquare does decide to attempt to monetize such deals, it’s unlikely to be quite as straightforward as simply flipping a switch and accepting money to show coupons. For example, if there are tangible incentives to be a mayor of an establishment, this is likely to encourage cheating. Foursquare has been working on ways to combat that, but depending on how good the deals are (a free beer sounds pretty good to me), it will undoubtedly be a challenge. There’s also the issue of price. How much do you charge a business to show these deals? Certainly it’s in the a local businesses interest to have these types of deals as it will probably drive more traffic to their establishments, but Foursquare would also already be getting a bump from the fact that the deals also entice users to use Foursquare. Such deals would likely have to happen on a massive scale for Foursquare to make significant money. And if/how quickly that happens will be a testament to the power of local and location services overall.